The standard journey taken by an aspiring pitmaster when they first buy a grill is to start by grilling burgers, hotdogs and wings. But it’s not long before confidence grows and larger chunks of meat are attempted and they try to master the classics of pulled pork, brisket and ribs. This journey is fun and a great learning curve, and as much as I love a plate full of meat, there comes a time when you realize the meat dish is enhanced with a nice side of roasted vegetables. Or you might even want to expand your skill set and try grill fish and shrimp. This is where having a grill basket comes in handy, and why I’ve written this guide to the best grill basket for fish and vegetables. 5 What Are Grilling Baskets For? I understand we are a nation of busy people, so with this in mind, I’ll start this best grill basket guide with my recommendations. Below you’ll find several of the best grill baskets available for different types of use. You can happily buy any of these grill baskets knowing you’ve got a good product. But I do recommend reading the rest of this article for information on what to look for in a quality grill basket, different styles of basket and tips for using your new bit of kit correctly. Copper Nonstick Round Grill Basket Wok – The first thing that strikes you with this vegetable grill basket is its appearance. 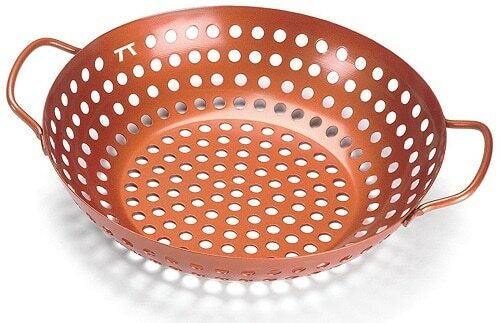 A round basket with nicely laid-out holes in a beautiful copper color. But don’t let the color fool you, this grill basket isn’t made out of copper. It’s made from steel and has a nonstick copper-colored porcelain-enamel double-coating applied, which sounds fancy because that’s exactly what it is. This wok grill basket, made by Outset Inc, is part of their nonstick professional-grade grilling range. It’s been designed to withstand extremely high temperatures from heat or open fire and yet be easy to clean. The nonstick coating doesn’t contain any PTFE/PFOA’s which makes it safer/healthy for cooking equipment. Due to the materials used in constructing the Outset vegetable grill basket the body of the wok heat’s slowly, allowing the whole surface to heat evenly which eliminates hot spots that will overcook your food. And as the handles have been spot welded on, and aren’t part of the main body, they do not conduct all the heat from the wok, meaning they will be cooler allowing the basket to be moved easily – although I still recommend getting a good pair of BBQ gloves. The looped handles are also great for hanging the grill basket to save on storage space. The only negative of a circular wok grill basket is that it has less surface area across the bottom when compared to a square grill basket. This means if you intend to use the grill basket for grilling fish you’ll not be able to cook as much as you’d be able to with the square basket. Large Weber Original Stainless Steel Fish Grill Basket – Firstly, this fish grill basket is made by Weber. 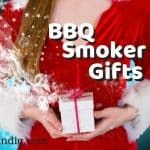 For those of you that aren’t big into BBQ and smoking food, Weber is the biggest brand name in outdoor cooking. They hold this title because they sell good quality grilling equipment, so you know if something carries the name Weber on it, it’ll be high-end equipment. I’m recommending the large Weber fish grill basket, however, if you only have a small grill space they do offer a smaller version. The large fish grill basket measures 18 inches long, which is big enough for the whole fish (including the fish head) of most of the popular delicate fish that are commonly grilled. 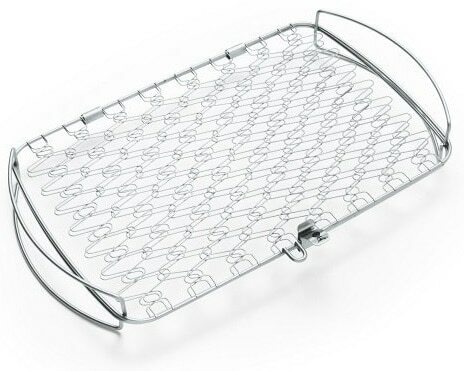 The design of the Weber fish grill basket is a flexible wire mesh secured with a solid stainless steel frame. It opens and closes like a book, with hinges on one side and a locking clamp on the other. You place the fish in the middle and close the unit and the flexible mesh forms around the fish keeping it held in place. You flip the whole grill basket when you wish to grill the other side of the fish, you do not flip the fish in the basket. A negative with this style of grill basket, and one I must confess I haven’t had but I’m always aware of is that the locking mechanism can be easily damaged. This can lead to disaster when flipping the fish over. You should always be careful when turning the fish and hold the grill basket in a manner so that it can’t spring open when you are turning it. Stainless-steel Jumbo Grill Basket with Removable Handles – This grill basket is another offering from the Outset Inc company. I’ve called this a large grill basket because it’s very deep, which means it can hold lots of vegetables or shrimp. The main plus point for this style of grill basket is the lid. This makes tossing veg very easy as you no longer have to worry about the food flying out. This should be reason enough to love the lid, but it also has the added bonus of being turned into its own grill basket – simply take the lid off and turn it upside down. So the Jumbo Grill Basket is actually two baskets for the price of one. The removable handles is another nice touch for the Jumbo Grill Basket, you’d remove them when doing a slow roast with the grill lid closed, but have them attached if doing a fast sear over an open flame – with the handles helping with tossing the food with a little flick of the wrist. Grill Basket for Grilling Veggies, Fish, Meat, Kabob, etc – The best all-rounder, the grill basket that’s good for lots of jobs. 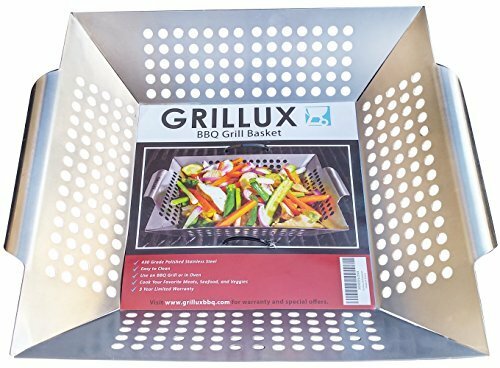 That’s what the Grillux grill basket is, and the one you should buy if you’re new to grilling or don’t grill very often. The price is very reasonable so you can’t go far wrong using this unit to test out grilling a few veggies and fish. I’d say this is more an entry level grill basket and you’ll want to upgrade to one of the others if you start taking your grilling more seriously. 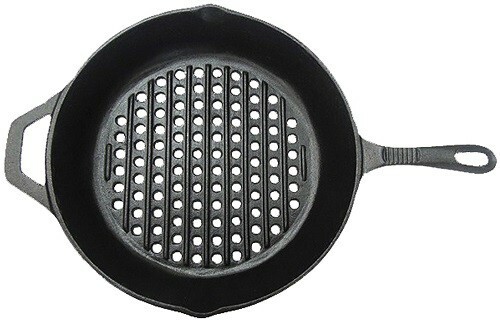 Round Grill Pan, Cast Iron Grill Basket – Not the material you’d expect when looking to buy a grill basket but cast iron cooking has seen a resurgence in recent years. Cooking with cast iron has been performed for thousands of years, anything that’s been used for that long and still hasn’t died off must have some great qualities. Cast iron takes longer to heat but distributes this heat evenly. None of the materials in the other grill baskets come close to cast iron for this benefit. And as long as you keep cast iron well seasoned you’ll not have any problems with food sticking. Best of all, if looked after correctly, a cast iron grill basket will likely outlive you. Of course there are some negatives to using a cast iron grill basket. They take a lot longer to heat up and it’s a lot heavier than stainless steel. Stainless Steel Kabob Grill Baskets – Before talking about kebob grill baskets I must confess I’m not really a big fan of them. Maybe it’s because I’m old school and prefer my kebob to be skewered. I was more than happy with how I’ve always had kebobs and although these kebob grill baskets seem a good idea (they would definitely save on prep time), I’ve never found them to have been of the best quality. Non-Stick Meatball Basket with Rosewood Handle – This is a bit of a novelty grill basket but I love it all the same. I’m a big fan of meatballs and an even bigger fan when I can cook them on my grill, with some chargrilled tomatoes that I blitz into a sauce and make a meatball, tomato sauce, and jalapeno sub. Of course, you don’t really need a grill basket for meatballs or need to do just meatballs in this grill basket. Any food that you “ball” can use this basket, such as moinks. The one major downside to this grill basket is the handle. It’s not removable which means I’m unable to close the lid on the grills. I tried to have the handles poking out, but lost too much heat. In the end I ended up just cutting the handles off. Grill Mats – I’ll not say much on this as we have a whole article dedicated to the best grill mats. But these mats have become extremely popular for people that like to grill vegetables and fish, and are definitely worth considering before deciding on buying a grill basket. 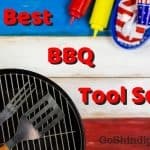 Having given you my recommendation on what is the best grill basket let’s now start with the buyer’s guide on how to choose and use your grill basket and what was my thought process in choosing the above selections. Firstly, I wanted to pick the best grill basket from each of the different types of the popular baskets. Wok Grill Basket – A wok grill basket can be either round or square. The shape doesn’t matter, as long as the basket has high walls that come off at a steep angle and which allows for food to be easily tossed, flipped or stirred. Easy Flip Clamp Grill Basket – This style of grill basket is mainly used for delicate fish. They have a flexible center that still needs to be strong enough to hold food in place when flipping. Mesh Grill Basket – Normally a circular bowl, with a solid steel cage to keep its shape, and steel mesh wrapped around it. Normally used for the smallest of veg. Kebob Grilling Basket – A long, thin, cubed steel cage. Normally with long handles. Now you know the different types of grill basket that’s available it’s time to look at the individual elements that make the best grill baskets. On the whole, grill baskets are a pretty basic piece of bbq equipment. But there are several key points you should keep in mind before selecting the basket that’s best for you. Quality material is what makes a quality product, it’s the one area you don’t want to cut corners. You want a strong, durable material that can withstand high temperatures without melting or warping. Below are the four types of material you should look for, plus their pros and cons. The size of a grill basket you should buy should only be answered by you. You know the number of people you normally cook for and the size of the grills you have. Big isn’t always better for a grill basket because unless it’s fish that you’re cooking, the basket will be used for side dishes, meaning you’ll likely already have something cooking on the grill. The depth of the grill basket is the most important dimension. The walls of the basket must be high enough to keep your food from spilling into the grill when tossing or stirring. I’d also recommend looking at grill basket walls that come off at more than a 90-degree angle to the base. This makes tossing vegetables a lot easier. Handles should be wide enough for you to be able to pick by the grill basket while wearing heat resistant gloves. I’d stay away from wooden handles even if they are just at the end of a long handle, as the heat will damage them after several uses. Remember that most grill basket companies only give the dimensions of the basket, if the handles aren’t removable you’ll have to take the size of the handles into account when measuring to see if the grill basket fits your grill. The holes should never be a problem, I’ve never come across a grill basket where the holes have been too big or small. They simply have to be big enough to allow the heat through and any marinade to drain. And not so big that the food falls through the holes when getting tossed around. Sounds silly listing safety for a grill basket, but if you’ve ever sliced your finger on a burr or sharp, unfiled edge while cleaning a steel basket you’ll not forget it in a hurry. It’s very easy to check for sharp edges before using, and once you have done it, you’ll not have to do it again. Mesh grill baskets are the hardest of all the baskets to clean. Food just loves to get stuck in the little holes. As long as you use a scrubbing brush and not a sponge you will be ok though. Most other grill baskets are pretty easy to clean, either you just dump them in the dishwasher or, if you’re hand washing, be careful not to scratch or chip the nonstick coating. Just like with grill basket holes, you shouldn’t have to worry about temperature constraints. If a company is making a grill basket that can’t handle high temps they’ll not be in business for long. But if you are buying a very cheap basket, or making your own by drilling holes into a dog bowl or something similar, it’s something you might want to look into. Rather than explaining how to use a grill basket, which is pretty easy, I think it’s better to see it in action. So I have added two videos below. The first video is a clamp style grill basket being used with fish and the second is vegetables in a wok basket. What Are Grilling Baskets For? The obvious answer to what are grill baskets for? is food. And you can grill any food in them. But that is the purpose of your grill grates. I use a grill basket for anything that is small and is likely to fall between my grates, or for food that could break apart while flipping. So the main food I use a grill grate for is fish, shrimp, and vegetables. In order to stop vegetables sticking to the grill basket, many people oil their veg. Granted, this does stop the veggies from sticking. But when grilling at very high temperatures the oil burns and the remnants cling to the veg leaving a “rancid” flavor. Having the choice of veg sticking or disgusting tasting veg is the classic rock and a hard place. Thankfully there is a third option. Lightly oil the grill basket and pre-heat before adding the food. When cooking several different types of meat, let’s say, chicken breast, hot dogs, shrimp, brisket and ribs, you’d never think it’s a good idea to chuck them all on the grill at the same time. Yet people do similar with vegetables. Just as meat has different cooking times so do many vegetables. So if you want a variation of different veg, try and choose ones that are a similar consistency and cut them into similar sized chunks. Alternatively, you can add the veg at different times. BBQ food is famous for its strong flavors, either with rubs or sauces, so be sure to give some flavor to your grilled vegetables or they’ll just taste extremely bland when compared to the rest of the food on offer. Often people are scared to add to much salt, pepper or spices to their veg, but remember this is grilled veg and only the outsides of the veg will have S&P and spices, and much of that will fall off. So don’t be shy and sprinkle loads on. Preheating a lightly oiled grill basket gives best results because the oil stops the food from sticking, but when it’s hot it quickly crispens the outer surface of the veg which stops it from absorbing the fat and giving it a greasy taste. The most common mistake when grilling veg in a grill basket is overcooking it. If your veggies are soggy your guest will simply not eat them and you have wasted your time. Remember to take into account carryover cooking and take your veg off the grill a little bit earlier. The point of a grill basket is to grill the food contained within it. This only happens with the food that is in contact with the hot surface, so to be sure all the vegetables are getting a nice even grilling be sure to regularly toss them. Learning to control the heat of your grill is the first skill you should try to master. Without this skill you’ll only ever make substandard food. For beautifully grilled veg, treat it like you would a steak. Get the grill basket nice and hot before adding your veg for a nice sear. Then, move the basket to a cooler part of the grill so the crust doesn’t burn, but the insides have time to cook. guys give it a try to outset BBQ sets and you’ll see the difference, I have a basket grill and I do pretty much everything on it and it’s amazing plus its made of rosewood the handler. I live the link down so you can check it.